Diets work by reducing the amount of food that we eat. Some diets are drastic, say, only allowing lemon juice and cayenne pepper. Other diets are much more forgiving, even allowing “cheat” days, when you can eat whatever your want. The Fruitarian Diet takes eating restrictions to a far, far away land: you only eat fruit. The Fruitarian diet is not difficult to grasp. You eat fruit, just fruit. Seems simple, doesn't it? Well, it turns out to be slightly more complicated than that. There are a few rules to follow. The Fruitarian diet divides the world of fruit into 7 categories. These groupings aren't complicated, and even make a bit of sense. To follow the Fruitarian diet correctly, you only eat one category of fruit at a time, allowing an hour or two to pass before you move on to a different fruit category. You can eat until you feel full, but strictly from one fruit category. You can eat as often as you wish, following the rule about separating the fruit categories. One obvious fruit category is dried fruits. Not surprisingly, these are drive figs, dates, apples, bananas, apples, cherries and apricots. Consider the drying method when selecting these fruits. Many producers involve a lot of nasty chemicals in the drying process, but you can easily avoid this through careful label reading. Seeds are an equally obvious fruit group. Strict adherents only eat sesame seeds, squash and pumpkin seeds and sunflower seeds. 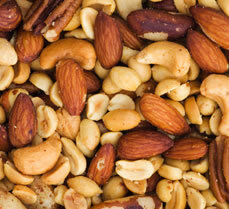 An adjacent category, nuts, cover your typical cashews, walnuts, almonds, pecans, pistachios and macadamias. Less obvious are the oily fruits. Coconuts and olives are oily, so that makes sense, but apricots are included, too. This is a bit harder to remember. Then we come to the acid and sub-acid fruits. Acid fruits are those that might make your mouth break out: pineapples, kiwis, cranberries, strawberries, pomegranates and citrus. The sub-acid fruits are peaches, cherries, blackberries, blueberries, pears, figs, mangoes and apricots. That only leaves sweet fruits, which are persimmons, melons, grapes and bananas. There! You now know the 7 fruit categories. One surprising tenet of the Fruitarian diet is that you don’t need to drink water. You can (and should) drink fruit juice, but that should be your only source of hydration. Be cautious when selecting pre-packaged fruit juice, too. Many times the juice is actually sugar water with a splash of fruit added. Be a careful shopper and get the unsweetened, 100% fruit juice. Followers of the Fruitarian diet point to amazing weight loss. Some believe that eating a strictly fruit diet can be part of the journey toward enlightenment. The Apple Computer founder, Steve Jobs, was well known for his belief that eating strictly fruit was the best way to be healthy. As a side note, the actor Ashton Kutcher adopted the Fruitarian diet to prepare for his role as Steve Jobs in the movie “jOBS” and ended up in the hospital. Is the Fruitarian diet your path to enlightenment, or at least a slimmer you? Taken in short doses, maybe so. But talk with your doctor first to make sure that you don’t end up in the hospital bed beside Aston!